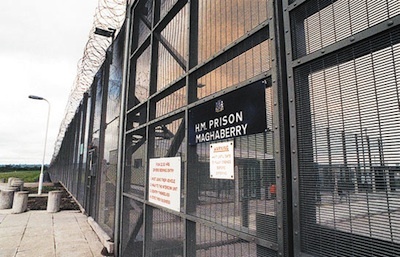 A decision by a group of 22 prisoners on Maghaberry’s Roe 4 landing to call off their ‘dirty’ [no-wash] protest to facilitate talks on a solution to the prison crisis has been welcomed by politicians in the North. The prisoners of Roe 4 are broadly linked to the regrouped ‘new’ IRA, the organisation which earlier this month claimed responsibility for the death of a Maghaberry prison guard. The situated at the County Antrim prison had escalated in recent months to the point that members of the jail’s notorious riot squad had taken over day-to-day duties on the Roe 4 landing. The decision to call off the long-running protest there welcomed by most of the nationalist political parties as a genuine attempt to reduce tensions and encourage progress. Part of the dispute centers on the failure of prison chiefs to implement a deal reached in August 2010. That agreement included the introduction of a body scanner to the prison which would do away with strip searches, which have been conducted in a brutal fashion. However, the prisoners of Roe 3, who are supported by the Republican Network for Unity (RNU) and Republican Sinn Fein (RSF), remain on protest. Five other republican prisoners held in solitary confinement, and who have sought a move to Roe 4, will also remain on protest until their demands are met. It is understood the prisoners on both landings will also continue to refuse to co-operate with strip searches. The move by the Roe 4 prisoners was confirmed in a statement issued through the Irish Republican Prisoners Welfare Association (IRPWA) this week. “This initiative should be viewed as a genuine and sincere attempt to create the conditions in which a conflict-free environment can flourish whereby all are treated with respect and dignity is guaranteed,” the prisoners’ said. “A dialectical process of engagement to resolve all issues should be the order of the day. The prisoners called on politicians to support renewed attempts to broker a deal. “Upon launching this initiative we call upon all those political parties and groups who profess to share our stated aim of a conflict free environment to immediately seize upon this initiative. “We call upon you to use your political influence and position to bring about the progressive change that is required. Six-County Justice minister David Ford welcomed the move. “The ending of the protest removes a barrier and will hopefully allow for a more normal environment to exist on the landing, which will be beneficial for both staff and prisoners alike,” he said. Sinn Féin Assembly member Raymond McCartney said the development “creates the space for the resolution to the prison dispute”. He added: “The agreement reached in 2010 provides the way forward and with good will on all sides this is an opportunity to end the protest within the prison. SDLP assembly member Pat Ramsey said it was important for prison management to show “good faith” in response to the prisoner’s decision to end their protest. éirígí spokesperson Pádraic Mac Coitir said the initiative, was a bold step by the prisoners “to de-escalate an increasingly dangerous situation”. In a note of caution, he added: “It should also be remembered that previous initiatives by the prisoners in Roe House to resolve the ongoing impasse were rewarded with acts of bad faith by the prison authorities. However, other republican prisoners are maintaining their stance. Roe 3 houses 20 Continuity IRA, Oglaigh na hEireann and independent republican prisoners. Eleven of them are continuing to take part in actions which include a full ‘dirty’ protest, that involves smearing excrement on cell walls. Geraldine Taylor from Republican Sinn Fein said those prisoners aligned to the party would remain on protest “until they get what the government signed up to”. “The agreement should have been implemented and the prisoners still haven’t got what was agreed to,” she said. A spokesman for prisoner welfare group Cogus, which represents RNU inmates, said they would also continue to protest, but that they are open to dialogue. “We are eager to see a resolution to the ongoing protest that we are engaged in and are open to sincere and genuine dialogue allowing for all republican prisoners to serve their sentences with dignity and respect,” the spokesman said.